Making the Maven Episode 120: You can’t force your clients out of their routine overnight. 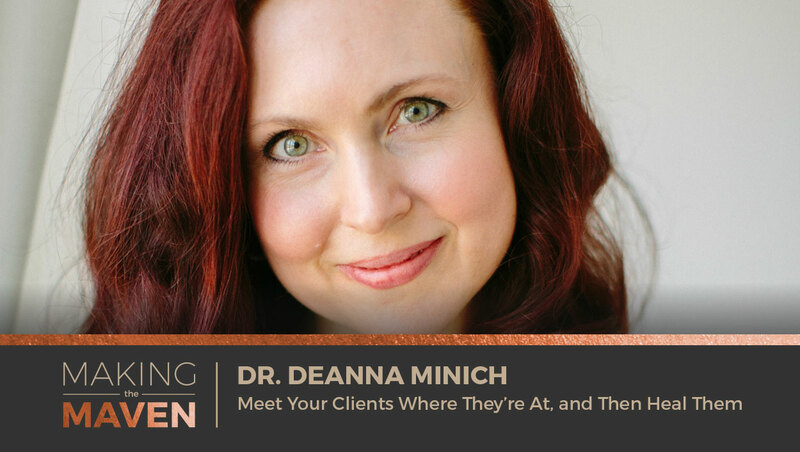 Dr. Deanna Minich is an internationally-recognized teacher, author, scientist, speaker, and artist. 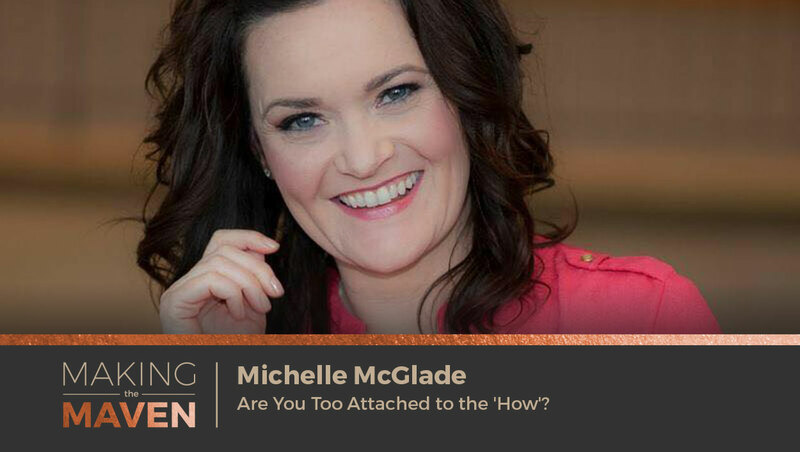 She has more than 20 years of diverse, well-rounded experience in the fields of nutrition and functional medicine, including clinical practice, research, product formulation, writing, and education. On today’s show, Deanna shares how she helps her patients change bad health habits into good ones, how medicine and healing are an art, and so much more! *Are you struggling with your online marketing? Struggling to get clients? 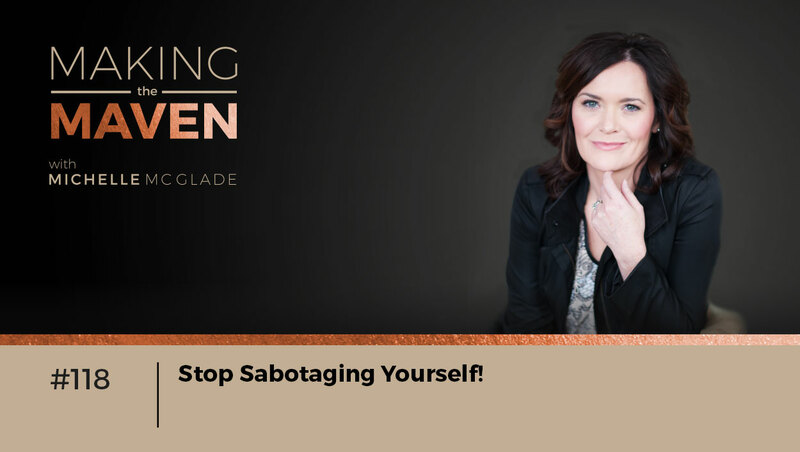 I have a webinar coming up for you! *Deanna’s mother was a health nut and Deanna would rebel against that, which ended up causing some emotional eating issues for her while growing up. *Deanna had to discover herself and through that, she found out what being healthy really meant. *Shoutout to Dr. Jeffrey Bland for being Deanna’s awesome mentor. *For health practitioners, how important of a role is science for them? *There is an art to medicine and there’s an art to healing. It should really be called the healing arts. It’s not a ‘private practice.’ People aren’t ‘practice’! *It’s important to have a 3-pronged approach. To be centered in the heart, grounded in the gut, and strong in the mind. *Where are health practitioners weakest in this 3-pronged approach? *When Deanna thinks of leaky gut, she thinks about leaky boundaries. Everything is connected. *Whenever we have a personal crisis, we don’t want ourselves to suffer, but we also don’t want anybody else to experience what we’ve gone through, either. *Why do people make such bad choices when it comes to food? Deanna still doesn’t completely understand why. *Deanna is helping her clients bridge the gap between what’s the most important thing in their life to their health. *At the end of the day, we have to meet with people where they’re at. You can’t force them out of their routine overnight. *Get your clients to focus on one and only one thing at a time. If they try to change too much at once, they’ll lose focus. *Deanna has a 16-week course on how to align foods with supplements available right now! Let’s talk about Making Money in Wellness! Because when you make money, you’re not only taking care of yourself, but you’re able to take care of, reach and touch more people out there! 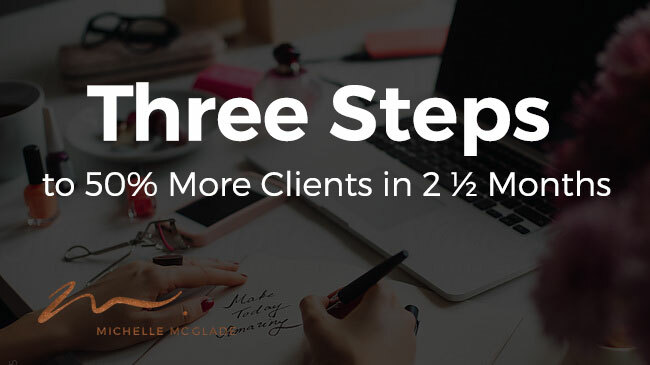 That’s exactly what I want for you, so let’s discuss Three Steps to 50% More Clients in 2 ½ Months! Who doesn’t want to book up their calendar by 50% more? Especially if it only takes 2 ½ months! This is a huge deal if you’re brand new and just getting started in your wellness business. I was inspired to talk about this topic by a client of mine, who is a brand new practitioner. I had the pleasure of working with her for three months and the first month, she was still working in a different job, trying to transition herself full-time to her new acupuncture practice. And she did an amazing job of putting herself out there and following a framework that we created together! The results spoke for themselves! When she started, she had 20 clients booked on the first day! That’s amazing and in reviewing her results over 2 ½ months, she reported that her calendar was already 50% full! CONSISTENTLY, which is the key! So what did she do to achieve these results? These three steps made all the difference to help her think more globally and strategically. And it’s not that complicated! Let’s discuss thinking about the tasks you need to accomplish and how you’re spending your time. Now, let’s put those tasks into three buckets and discuss what to prioritize. Here, enter any activity or task related to sales and marketing. This includes all the “junk”. Paperwork, phone calls, emails, billing, ordering supplies, cleaning the office. All of those items we want to lump into the operations bucket. This one often gets forgotten about. Here, include all of your accounting and financial items. So how should you prioritize your time? First, looks look at the Operations Bucket. Get your forms together, set up that website, continual learning. You’re doing something productive when you work in this bucket when you’re starting up your business. Create handouts for clients that you don’t have yet. Get things ready so when you DO have the clients, you’re not scrambling. I don’t want you to focus on the wrong bucket! Next, I have a feeling you’re spending tons of time on lead generation, which is found in the Sales and Marketing Bucket. And that’s where you need to be spending your time in Month 1, Month 2, etc. If you want to be fully booked or have any clients in the first 2 ½ months of your business, you have to get clients in the door, which is through sales and marketing! But you may use a lot of the materials you created in the Operations Bucket to than use in Sales and Marketing! Bingo! If you focus on the right bucket in your business and stop convincing yourself you can’t do it, you’re going to fill your calendar quickly! Making the Maven Episode 119: Sonia has only been in business for two months and she is rocking it! On this week’s show, I wanted to bring on a fellow coaching student of mine. 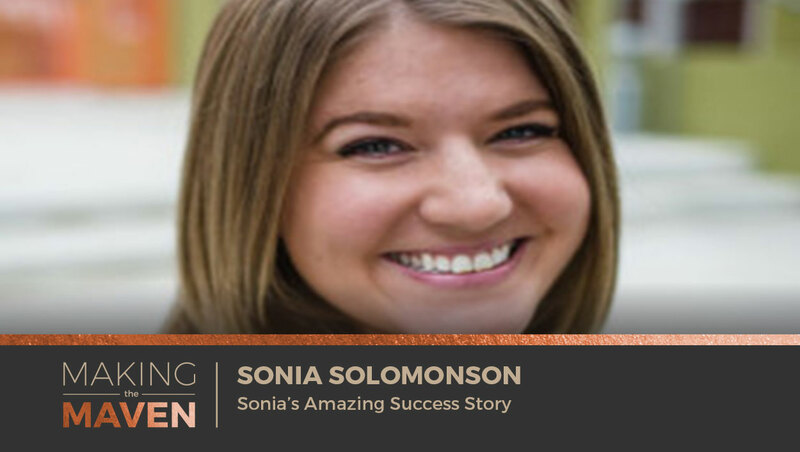 I am so proud of Sonia Solomonson’s success. Sonia literally went from unfulfilled employee to business owner with 20 appointments on opening day. The crazy part is, she’s only been in business for two months! This stuff really works when you do the work and I want you to use Sonia as inspiration to stop being unfulfilled/complacent and start taking actions to fulfill your life’s purpose. *If you’re sick of hearing me tell you owning your own practice is possible, then you must, must listen to what Sonia has to say. She is crushing it and so can you! *I have a new training out for you guys. Link in the show notes! *Where was Sonia in her career before she started her business? *Sonia became complacent with working for somebody else, yet she was very unfulfilled. *After talking to friends and family, Sonia realized that she’s still young and the decisions she makes now are going to set her on a certain path for her future. If she’s not happy now, what will she be, 5 years from now? *Where is Sonia today and what does her business look like? *On Sonia’s opening day, she had 20 appointments! *Things really opened up for Sonia when she specialized. Everyone BUT the acupuncture community told her to do that from day one. *Are you thinking about hiring Michelle as a coach? Sonia says you gotta stop thinking and start doing it. *At only two months in her business, Sonia has experienced rapid growth. She knows she wouldn’t even be nearly as far a year into the business if she tried to do this on her own. *She feels like she’s finally coming out of her shell. *Sonia has never hired a coach before, but being able to have accountability weekly was amazing. *Sonia is an amazing inspiration for fellow practitioners everywhere! *Before Sonia worked with me, Sonia was not jumping out of bed every day to get to her job. She was exhausted when she came home. She wasn’t miserable, but she definitely wasn’t having fun either. *It really works when you do the work! *Your messaging needs to be put in layman terms! Who are you really speaking to? Not your colleagues! *To be honest, making money is really boring. Showing up every day and doing good work makes life more interesting, engaging, and frankly, worth living! *All you need to be is clear on where you want to go. You don’t need to work out the details of ‘how’ just yet.